(Bloomberg) -- The Federal Reserve delivered yet another dovish surprise for financial markets. The dollar sank in the most in nearly two months, Treasuries posted the biggest gain in over a year and stocks...didn’t do much of anything. Blame it on the banks. 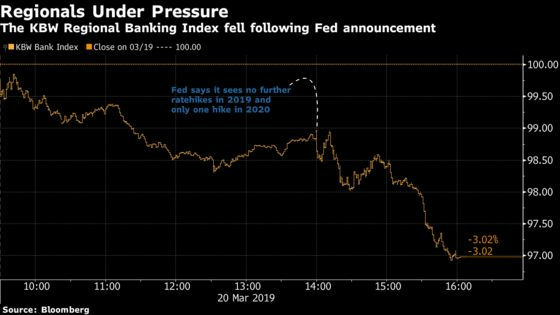 Financial firms in the S&P 500 sank the most in more than two months after Jerome Powell’s central bank held rates steady and signaled it intends to keep them there through at least the end of the year. The group of lenders and insurers, which account for 13 percent of the benchmark index, swooned as the 10-year Treasury yield plunged to the lowest in more than a year and the difference between yields on short- and longer maturity debt flattened. The pain was most severe for regional lenders that rely more heavily on interest income than diversified banks. The KBW Bank Index sank 3 percent, the most since Dec. 4, with all 24 members down at least 1.7 percent. Goldman Sachs Group Inc. slid 3.4 percent for the biggest drop in the Dow Jones Industrial Average, while all 22 insurers in the S&P 500 finished in the red. The S&P 500 fell 0.3 percent on the day after rising as much as 0.4 percent in the aftermath of the Fed decision. While banks bore the brunt of the selling, the dovish tilt also reflects concerns that economic growth is slowing -- signaling to equity investors that further cuts to corporate profits might be in the offing. More than 200 firms in the S&P 500 are now expected to earn less than they did a year ago, data compiled by Bloomberg show, more than were in the same boat three years ago during a stretch generally viewed as the worst profit recession of the bull market. Powell said the economy remains solid but is growing more slowly than last year, when gross domestic product surged and stocks fell. While the Fed chairman signaled little concern that a recession is near, fed funds futures showed the odds that the central bank’s next move is a rate cut at even.